Here in Utah, we get some pretty hot summers. And no one wants to spend the heat of the day sweating in their carseat. Whether you’re commuting to and from work, or heading out on a family road trip, you want to be comfortable and cool in your car. At Master Muffler, we can get your air conditioning system back to tip-top shape, ensuring a nice cool breeze and a comfortable ride for you and your family. Your air conditioning system primarily works through cycling refrigerant through high and low pressure, utilizing the rapid cooling that happens when it expands from a liquid to a gas form. Compressor: The compressor takes the refrigerant when it’s in a gas form and pressurizes it, and pumps it through the system. Powered by the serpentine belt, the compressor is the core component of any cooling system. Condenser: From the compressor, gaseous refrigerant moves to the condenser, which transforms it from gas to liquid form. The condenser looks very much like a radiator and can produce a lot of heat as it removes it from the high-pressure refrigerant. Receiver-Drier: The receiver filters the now-liquid, highly-pressurized refrigerant in order to remove debris or water. These extra elements can damage the air conditioning system. Thermal Expansion Valve OR Orifice Tube: Most cars’ A/C systems are similar, however the one place that they might differ is whether they use an orifice tube or a thermal expansion valve. In either case, both of these devices have the same job: to monitor the flow of refrigerant and relieve pressure so that the refrigerant can expand into gas form. Evaporator: The evaporator is there for the beautiful moment when the liquid refrigerant rapidly expands, quickly cooling the air. Usually, the evaporator is located right behind your dash, equipped with fins and pipes that also makes it look a bit radiator-ish. 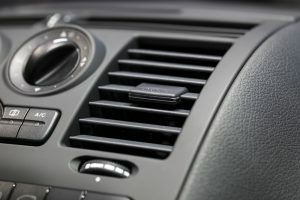 A blower fan pushes air over the evaporator and straight into your car’s cabin. From there, the refrigerant is again drawn into the compressor in order to cycle through the system again and again, providing you with deliciously cool air. Refrigerant is used because it evaporates at a low temperature, and condenses at a higher temperature. Refrigerant is any element that can be boiled into a vapor, and then compressed into a liquid. This means that even water is a refrigerant (and indeed, we take advantage of its cooling properties all the time.) However, other elements that are used specifically for refrigerant have a lower boiling point (or temperature at which they evaporate) and condense at a higher temperature. This gives us a faster cooling effect which gives us the chill of an air conditioner. Almost all air conditioners today use a freon refrigerant called R-134A, which replaced the old R-12 when we discovered how R-12 hurt the ozone layer with CFC byproducts. Many professionals recommend having your A/C checked every year. An A/C checkup can ensure the efficiency of your car, since running the air conditioner does take energy from the engine and cost you extra gas. Yearly checks can identify leaks early, which makes them easier and cheaper to fix, and can prevent one broken part from compromising the whole air conditioning system. Come by any of our 16 Master Muffler locations today. We can give your air conditioning system a checkup and if we detect any problems, we can get your system back to top function in time for your summer. Browse our locations here, and check out our coupons page for great offers and deals.